The Kfz 12 was a medium size cross country vehicle manufactured in Germany by the Horch company. It was widely used by the German army as a staff car and personnel carrier during WWII. The car was built by several companies, including Auto Union and Opel, from 1937-1943. The KfZ 12 was a six seat varient powered by a 79 Bhp V-8 Horch 3.5 litre petrol engine. It had a loaded weight of 3 tons and a range of 400 km on roads. Staff cars were fitted with map tables in the rear passenger compartment, otherwise it was the same as the standard personnel carrier. A towing hitch was standard so it could tow a 700kg trailer or small artillery piece. Cars built before 1940 have spare wheels mounted on the side while post 1940 cars stowed the wheels inside the body. The Einheits family proved expensive to build and maintain. it also suffered from being overweight. Thus production was terminated in 1943. 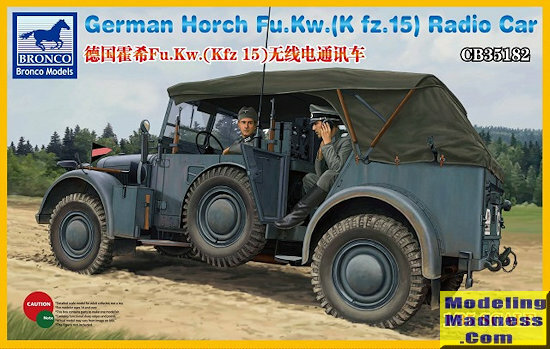 Other variants were the Kfz 15 radio car (the subject of this kit) and the Kfz 16 artillery observer car. Typical of Bronco kits, this one has a lot of parts. Detail is the keyword with their kits and this one is no exception. As an example, on this kit, each of the main frame side members is made up of two pieces onto which attach the cross members, several of these also being multiple pieces. To this are attached the mounts for the body, suspension, engine and transmission. Each of the transaxles comprises 15 parts and then you have each of the main suspension members, which contain dual coils. The kit is not a curbside and contains a complete engine, exhaust and coolant system. The wheels, which have separate tires, can be posed turned left, right or straight ahead. Once that chassis is on its wheels, then comes the task of attaching all the various body parts. This starts with the front fenders followed by the floor pan and then the firewall assembly. The instrument panel is next followed by the front and rear seats. Behind the front seats is a complete radio suite. One then attaches the rest of the body assembly. The hood can be posed open or closed as one wishes. There are a number of smaller compartments behind the rear seat and while not shown as being open, I'd make an effort to have the rear gate open otherwise this section will be practically invisible. Other options are to have no top, have the top rolled up, have side curtains installed, and to have the interior fully enclosed. Considering all the detail, it would be a shame to have it hidden from view. You can also have the windscreen folded forward with a covering over it, though that would not be a ppropriate with the top up or the side curtains installed. Photo etch is used throughout the build and Bronco includes a large and small fret for the various areas where it is to be installed. Instructions are top grade with each page superbly drawn and color information provided where appropriate. The p.e. bits are color coded, which is a big help with a project like this. 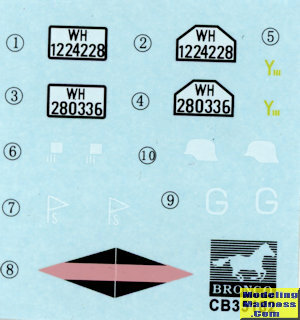 Markings are for two overall panzer grey vehicles on the Russian front in 1941 and 1942. The decals are nicely printed and offer what little is required. 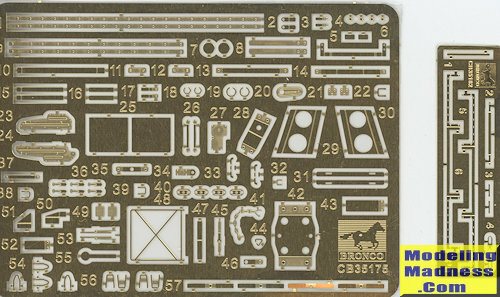 In concert with other Bronco kits, this one is not going to be a fast build and is definitely for the experienced modeler, thanks to all the small pieces. For one thing, the builder will be getting a lot of 'bang for the buck' in terms of build time and the effort put into this one will pay dividends in the finished product. Thanks to www.dragonmodelsusa.com for the preview kit. You can get this kit today at your local retailer.